Have you ever wondered about the process behind my ceramic creations? This is quite challenging to answer in some ways as what may have once taken me 3 months to make may now only take 1, as the more I create and the more confidence I gain with the medium and the project, the faster I become. In many ways I also find it difficult to add time to my work as it has taken me over 10 years to be able to do what I do! I also cannot finish something in a day, or even a week. There are so many processes and each creation takes time. I then also need to wait for things to dry and fire, there are many variables that are out of my control and not everything turns out as planned. But instead of going on about all that, here is a little guide to give you a bit of an idea of what happens behind the scenes of my creations. First off I need to come up with designs. My work is heavily influenced by nature. I take lots of photos, am out in nature and surrounded by it most of the time, loving the outdoors, camping and also living in the Perth Hills. I then draw up my ideas, sketching in notebooks, colouring in, adding ideas and insights. Choosing the correct form, size and material is important and takes time to get it right. I usually use porcelain clay to create my work, and depending on the size, thickness and form, I use straight Southern Ice Porcelain. I love this medium, finding it to be one of the best clays we have here in Australia, very strong, extremely white, but also with its challenges. 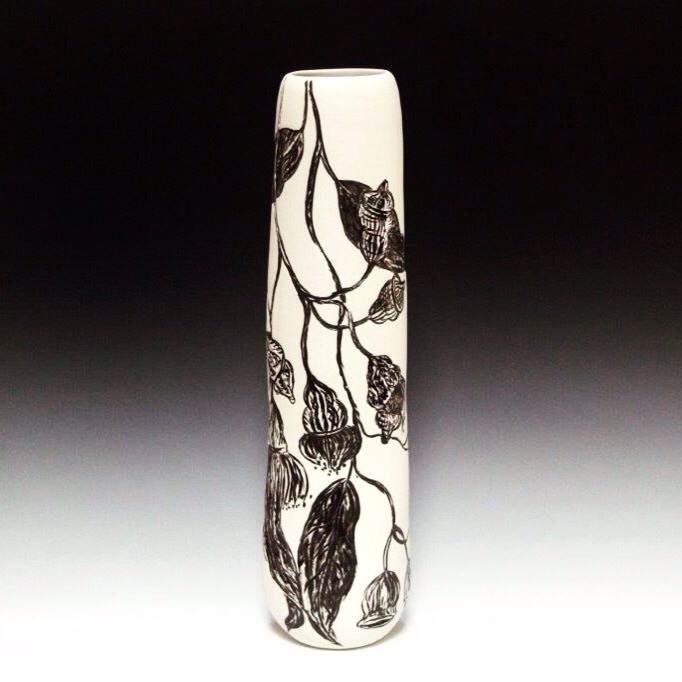 I blend Southern Ice with Superior White Porcelain Clay when creating larger works or my Black Series of Botanical Vases. 1. Wedging, blending and preparing clay as well as adding stains to make coloured clay bodies for my marbled collections. 2. Weighing the clay and rounding it off to get it ready for wheel throwing. They clay also needs to be at the correct softness or firmness for the item I am creating. 3. Throwing the form on the potters wheel. I love this process and it's over again all too soon. I find it very meditative as the wheel spins and your hands work in rhythm to create a symmetrical form. 4. Drying the work to leather hard so it can be trimmed and a foot-rim turned into the bottom of the work. 5. The work is then dried a bit further to allow cleanup and the design to be transferred onto the vessel. At this point, if the work is black, I paint on a black slip made up from my clay body, stains and oxides. It is then painted in a wax resist to stop smudging and uneven drying in larger forms. 6. I then carve into the surface and often also use natural found objects to press into the surface for unique textures. I also carve my signature at the bottom, and at times the flora group or collection. 7. The work is covered and allowed to dry out very slowly over weeks or even months for larger pieces. 8. Once bone dry I level the base though sanding it on a flat surface to make sure it sits level. Each piece is then cleaned up once more with a fine fiber sponge to get rid of throwing lines or any roughness on the outside and inside. 9. Work is then stacked into the kiln for its first firing. I fire to a high bisque at 1060 degrees Celsius. 10. The next step is sanding... This is done with wet and dry sandpaper of different grids to get the perfect smooth finish on the outside of my work. Making it beautifully tactile, soft and smooth. 11. Glazing. I make up all of my own colour through careful testing and measuring. I pour the glaze into the inside of the work and then out, getting a nice even finish. The outside is hand painted into all the little grooves of the carvings and then carefully wiped back so that the colour just remains inside the carved design. I then handpaint highlights of colour or clear glaze into certain parts of the work as an added feature. 13. Once cooled they are once again sanded for a beautiful silky finish. 14. The final stages then involve inspection, quality testing, pricing, cataloging, photographing, promoting/marketing and selling! So there you have it! A little insight into how I make my creations. From my hands to yours, from my home to yours. Please enjoy and Rediscover Ceramics.